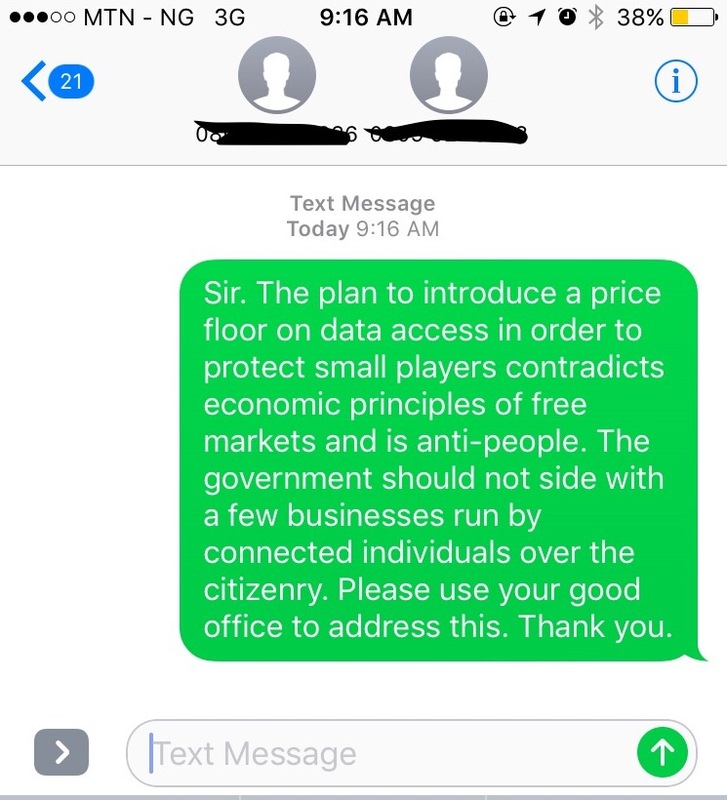 The NCC's directive to raise Data Prices makes NO sense! Imagine for a moment that NAFDAC requested Coca Cola and the 7Up Bottling Company to price Coke and Pepsi at N150 per 50cl bottle so that Big Cola can stay in business and gain share. Would you think it made any sense? I exaggerate a little for emphasis, but that is exactly what the NCC has tried to do with their recent re-introduction of price floors for data. In the absence of a press release from the NCC explaining their reasons, we turn to excerpts from a post on The Cable, the writer of which claims to have seen NCC’s letter to the Telecom Companies. “In order to provide a level playing field for all operators in the industry, small operators and new entrants to acquire market share and operate profitably small operators and new entrants are hereby exempted for the price floor (0.9k/MB) for data services,” it said. “For the avoidance of doubt a small operator is one that has less than 7.5 percent market share and a new entrant is an operator that has operated less than three years in the market. I have exerted great effort to avoid all news media, spending far less time than usual on Facebook, Twitter, and Quora. I scroll past furiously when news related to Trump appears in my newsfeed, and I am uncharacteristically missing CNN's Quest means Business for the second night in a row. When I made this post yesterday, I thought it was because I was weary of all the news about America's election. It had crept into my life and dominated my thoughts and conversations for weeks. I thought I was grateful it was over, so I hastened to document my thoughts in a bid to quickly move on. President Trump; Now - What Next? When President Obama ended this skit by saying "At least I will go down as a President", I wanted desperately to believe his implied statement that Mr. Trump would never be President - although I had my doubts already. Now it is confirmed: Donald Trump will also go down - at least - as a President. I am no political pundit, and I am not American. I am a concerned Nigerian who describes myself as a citizen of the world, and I am invested in living happily and helping other people rise above poverty and live happily too. I had a cornucopia of thoughts on the way to work this morning, and I wanted to document them so I can come back (hopefully) in four years and see how my expectations turned out versus reality. 1. Globalization is slowing rapidly, and nationalism and xenophobia are on the rise. My theory is that us (educated) folks from developing countries like globalization because it affords us the opportunity to move to and live in developed countries where systems work. (Educated) folks in developed countries believe in globalization due to a variety of reasons - including the exposure afforded them by education. Big businesses like globalization because they can leverage global supply chains to maximize gross margins. On the other hand - I also theorize that the (uneducated) natives in these developed countries who lose their jobs to immigrants are fed up with this situation - and are voting for that to change. Closely linked, people are tired of seeing their jobs move to Mexico and China, or go to Poles, Nigerians, or other immigrants who will do the same job for less money or benefits. Net - I think it's a new world order, one that is less "global".